Starring: Russell Crowe (Gladiator), Jennifer Connelly (A Beautiful Mind), Anthony Hopkins (The Rite), Emma Watson (This Is The End), and more. Directed by: Darren Aronofsky (The Fountain). Rating: PG-13 for violence, brief frightening images and suggestive material. 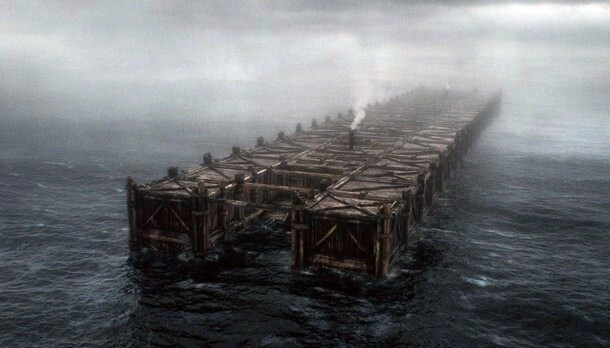 Aronofsky presents a film using one of his major strengths: visual presentations. The pre-Flood world that he delivers on screen is both vast and visually beautiful. Although the pacing and timing jumps quite a bit, the visual aspect is a treat to enjoy. The entire time I was looking forward to seeing how Aronofsky would present the rains coming down and the floods going up, but when the Flood finally came, it seemed so unsatisfying and anti-climatic. The cast, adequate in parts, really were less believable than desired. 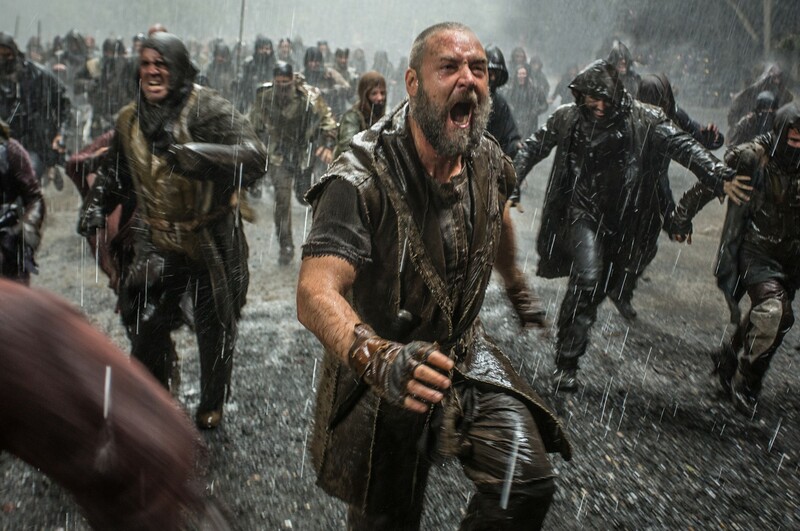 While Russell Crowe carries the extent of the acting, the additional members/characters felt more like time-fillers and drama-dealers than contributors to the overall film. (Emma Watson disappoints, Logan Lerman broods, Jennifer Connelly cries and Nick Nolte mumbles). Again, a beautiful film that suffers from less-than stellar acting, editing and story. 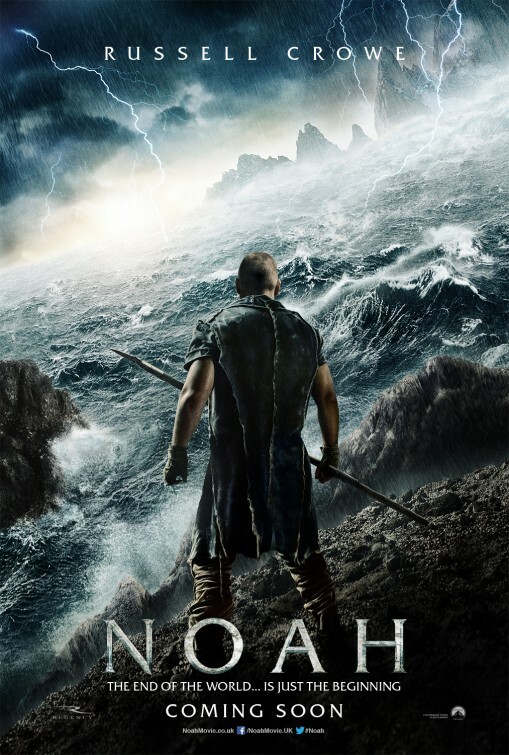 Even with the creative licenses that definitely steer this ark of a film in some very different directions darker than expected, Noah does very little to explain several different elements because it ignores (to a large degree) the main character in the entire account of Noah: God –and doing so makes it difficult to bring any type of credence to Noah’s character and presents him as simply one very crazy, suicidal and altruistic man. Noah, at its core, is an environmentalist movie that teaches that because of “what man has done to the earth” (and not “what man has done” [sin]), the Creator will destroy the Earth and that man is responsible to care for the Earth and keep it well (A pre-historic Inconvenient Truth). Looking for any type of further meaning in this film is rather futile. (and that is one of my main issues with the movie as a movie…its source material is NOT about environmentalism.) Oddly, the animals, the rain, the Creator…they are all major downplayed afterthoughts and it minimizes the story as a whole. The film begins in a very expected manner and then capsizes and shows itself to be a completely different type of movie that just doesn’t fit and leaves very little feeling of happiness or satisfaction once the waters recede. I do not blast Aronofsky for making the movie that he wanted to make, but this version just doesn’t work so well. The story, the acting, the subtext, the editing, it just didn’t jive like it should have. 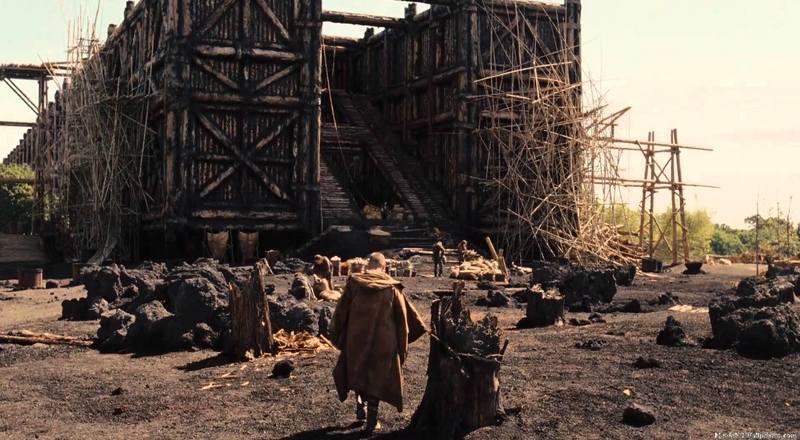 Beautiful, with aspects better than expected still, Noah put some images to imagination and is definitely “the least biblical biblical film ever made.” It wouldn’t have hurt to open up the Bible and use a bit more of it such as the reason Noah was chosen, the reasons for the Flood and more. 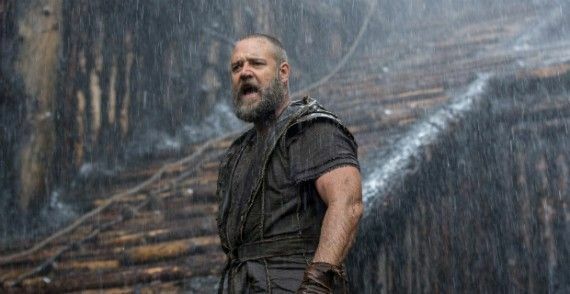 Regardless of beliefs, it serves little purpose for any movie to ignore major elements of its source…and Noah does…and it hurts it. Next Movie News Monday for March 31, 2014. Thanks for reading my review. I will be interested in your thoughts once you see it. I didn’t really enjoy that aspect of the film. What a great review!! AMEN brother! YES people, read your bible. I too wish they had done it according th the Bible. My computer crashed for about 3 months. What about Son Of God, did you see that one? was THAT according to the Bible? Oh, by the way, it’s Susie. Miss you my friend!! Thanks for reading, Susie! Glad to see you here. Hope your computer problems are all gone. I didn’t see Son of God but a lot of people have been going to it. Not sure that I will though. Definitely an environmental movie. Yes. I will be interested in what you think when you see it. I knew what to expect going in and rated/reviewed this film on the same basis as all others, but the fact that the source content was so ignored really bothered me. They said there wasn’t much written about Noah in the Bible and so they did more…but they didn’t even use all the info in the Bible about Noah to begin with. It’ll be a while before I see it, probably when it’s out on rental. Not a fan of Aronofsky to be honest. Black Swan was good but not something I’d ever want to see again. As you know I had been worried someone who has no regard for God (let alone Christianity) took on a Biblical tale, and I guess my initial hunch was right after all. Fine review and we definitely share many of the same reactions. I thought the film was a mess. It was also frustrating mainly because there is a much better story to tell there. Instead it teases us with all sorts of examples of how good it could have been. Also, something that really rubbed me the wrong way. Did you notice how manipulative the trailer was? There is a scene in it where Winestone says “You stand there alone and defy me”? Noah respoinds “I am not alone”. The entire intent is that God is with him (a clear ploy to entice Christian audiences). But it turns out it wasn’t God at all that he was refering to. Yeah. I noticed that “alone” part too. VERY misleading to be sure. We definitely differed on our reviews, but I think that had a lot to do with the fact that I went in to see it as just a movie, and I enjoyed it for what it was. I’m not of biblical films, and it is rare that I see one. (sorry for the delayed response. I’ve been behind and am now catching up). I loved the visuals so much on this one, but felt the story deserved more than what it got. I knew not to expect it to be exactly as the Bible says (there’s not a lot written to begin with) but this film really seemed to throw a lot of the Bible to the wind and create its own story. Creative licenses are fine, but, as a movie solely [my beliefs aside for a minute], when a film ignores quite a bit of its source content that may be vital to the telling of the tale…it makes me pause and wonder why, frustratingly, if it didn’t really do much for the story overall. *imagine Aronofsky having directed The Lord of the Rings trilogy and excluded Legolas, or Bilbo telling Frodo his story, or Gandalf’s battle against the Balrog…kinda the same thing here to a degree.